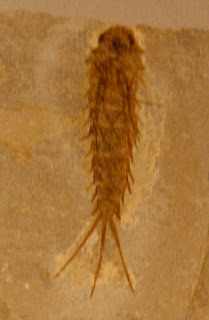 This insect larva fossil is called Ephemeropsis trisetalis. It dates to the Late Jurassic or Early Cretaceous Periods and was found in the Yixian Formation. The fossil was found in Beipiao City, Liaoning Province, China. This fossil was part of the Ultimate Dinosaurs: Giants from Gondwana exhibit at the Museum of Natural History and Science in Cincinnati, Ohio. They were photographed in August 2013. The dinosaur exhibit was created by the Royal Ontario Museum of Toronto Canada.